Monster party, spotlight on food. I thought I'd spotlight the food today, and show you our activities, decor, and favors tomorrow. We had a bit of fun with googly eyes, popping them onto toothpicks, and into some of the food... our little pepper-turned-monster sent my birthday boy into a fit of giggles before the party. I already showed off my googly-eyed cups, but aren't they even better with stripey straws? Yes, I thought so too. Oh, and the blackboard? hee. I had fun re-creating the scene from the "eek! a monster" stamp set that I used on all of the decor. (Full disclosure: I put Maia in the tub with some toys so that I could have 10 minutes alone to draw this masterpiece, and after about 15 minutes (oops), Maia was crying and Thomas was yelling: "you better come see, mom!" What I found was a whole lotta yucky mess...sigh.) Um, back to the food? My favorite touches were the fry boxes with the pretzels inside. I got the template *here* and just gave it the same newsprint+monster treatment as our invitations. I have a few of those cheap, plastic chocolate molds - after dipping the marshmallows and cake pops in the blue candy melts, I used the leftovers to make a batch of these star chocolates. Mmmm.... eyeballs. I made cake balls, popped an icing eye on the top and plopped it down into a bowl full of candy worms. The boys loved it. I'm only showing this picture because I can't stop cracking up at the googly-eyed-orange peeking out from behind the cupcakes. I like to keep things as unified as possible on the dessert tables: I popped some popcorn (my first time on the stove-top!) and drizzled candy coating over it. It was the perfect sweet-salty snack! They were all good. They all got their treats. Hope you enjoyed a look at our monster party food! See you tomorrow for the rest of the party! Also #2: is it Friday already? I'm getting really bad at keeping up with my TMKS Thursdays feature. (If you're just tuning in, that stands for "things my kids said"... I share my funnies, and then you get to share yours!) Something hilarious I overheard yesterday: the-now-7-year-old Sofia, in the middle of reading "Beauty and the Beast" out loud to Thomas, yoinked her book out of view and declared: "this part is not appropriate for you, Thomas. You're too young." Oh my! Even now, I'm racking my brain to think of which part she censored... no idea, especially since she was nowhere near the end. All I know is that I could FEEL her evil-grinning when Thomas let out a disappointed "awwwww." If you have any stories of your own, share them in the comments. I started out by printing the Helen Keller quote on a sheet of white cardstock. Then, I stamped the 2 hot-air balloons (masking the first one so it looks like it's in the foreground). The second balloon was also masked, and I stamped the entire mat with yellow chevrons and a grey sunburst pattern. (The grey "sunburst" is actually an image from the Wplus9 "super star" set, which I stamped 2x to make the full circle). The hot air balloons were colored in with copics, and I glazed the larger balloon with a layer of glossy accents. I wanted it to stand out from the other one, but didn't want to add bulk to the card with foam squares... sometimes, a little dimension goes a long way, no? I mean, how perfect that Nichole picked a photo of fabric, in pretty much the exact colors of the sewing party? hee. I did leave off the bolder pink color, and added some krafty goodness. I created the fabric lollipop flower by stitching different sizes of pink gingham circles together, and added a felt "flower fusion" shape and a button top layer. Other touches I love: the damask pattern on the banner, the clothespin embellished with a paper bow, and the sweet little "baby" tag. My only regret was that the day was dark and rainy, and the pictures don't reflect how amazing everything looked. I created some embroidery-hoop-decor, and my 2 favorites were the little girl silhouettes. Those, and the bow garland hanging beneath the shelf are on display in the girls' room now... the mini-sewing-basket-favor-boxes were put together based on a tutorial found here. You may remember the dolls that I made for the girls' Christmas gifts... they came in handy for added decor. I wrapped a foam wreath in some white linen fabric, and used all kinds of dies to embellish it with fabric and felt flowers. When the girls first came in, we dove into lunch. In the white frame is a sign that explains our "build your own sandwich" lunch. We had breads, meats, toppings, veggies and chips to choose from, and a panini press set up on the counter. This was such a stress-free party meal and we enjoyed every bite. A break for gifts :) Oh, and that t-shirt Sofia is wearing? We altered a long-sleeved tee based on this tutorial, and gave one to each of the girls. So chic! Our second craft involved an embroidery hoop with some easy-to-sew-through-burlap fabric for each girl. They stitched their monogram and further embellished their projects with some felt flowers and buttons. The girls did so well! Banana cupcakes, with honey-cinnamon frosting... and a strawberry mousse. We good 'n sugared them up.... and then sent them home. hee hee! Thank you for allowing me to share snapshots of Sofia's special day! I may not post as often as usual this week, because I'm neck-deep in setting up for our monster party this upcoming Saturday :) Your regularly-scheduled program will resume after party season is done! 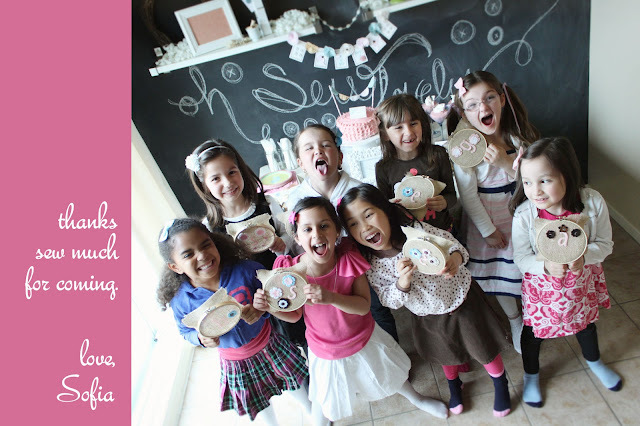 Sofia's sewing party is tomorrow! I will have a gaggle of girls (8 of them makes up a gaggle, right?) yelling about how the needle just poked them... ha! I hope they'll have fun! I love the whole kraft, pink, and blue color scheme - isn't it so flirty? The banner panels are made up of button cards (from PTI's "button boutique") and I added bow accents (from "bells and boughs") and buttons... lots of buttons. Just me, my camera, and my cup of coffee at 5am this morning. If you have a moment alone with your own cuppa, will you please send a prayer up for my brother-in-law's sister, who just gave birth to a less-than-2-pound baby at 29 weeks gestation. Sweet Olivia is hanging on for dear life, and her mama is beside herself. We are looking for a miracle. 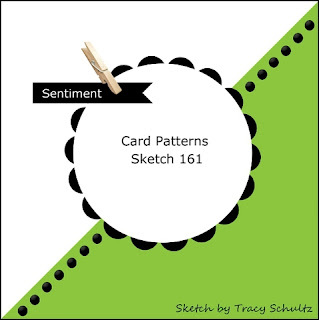 new digi stamps and a giveaway. When the very talented and sweet Melania Deasy contacted me to see if I'd help promote her new digi stamp set, "Aero boy", it was a no-brainer. I decided to work with my favorite pilot, but the set is full of more options, and some cheeky birds too :) I printed the pilot, and the city-scape, and colored them in with copics before cutting them out. I re-sized one of the greetings (ah, the magic of digi stamps!) and created a little banner to float behind the plane. I started out by stamping my cute kitty (from "taglines: critters") onto a scrap of orange patterned cardstock, and cut her out. I then stamped the kitten again onto a die-cut circle, and stamped the speech bubble nearby. Once I masked those two elements, I stamped a woodgrain pattern (from CSS "background basics 1" set) and used some distress ink to darken up the whole circle. I used a pattern from that same background set to create the blue+white pattern on the triangle mat. Love it. My favorite part of the card? 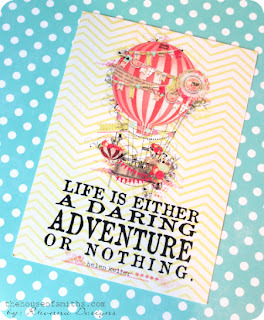 (besides miss kittie, of course...) The swirly pattern climbing the card alongside the orange scalloped border. It's the little things that make me happy! I'm also entering this card into the current CAS-ual Fridays challenge: using 2 colors, opposite each other on the color wheel. 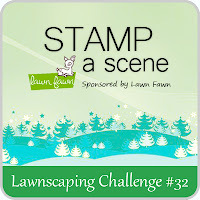 I'm so thrilled to be guest designing for the lawnscaping challenge today! The fabulous sponsor is... Lawn Fawn! Maybe they have wallpaper like that at gnomie hotels and he's just seen that painting that made him smile for his home... hee hee. And the props? They are there to prove how much I love gnomes... my daughter's 1st birthday party was wood-land themed... the sugar gnomes were cake-toppers! And I'll use any excuse to whip up a batch of cupcakes... these were banana-flavored, with a honey-cinnamon frosting... yum! 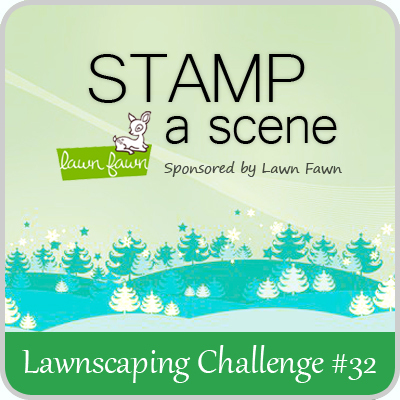 Hope you play along with the build-a-scene lawnscaping challenge! CAS-ual fridays - egg hunt. lawnscaping blog hop: spring edition!